Few can rival the achievements of Russell Thomas in real estate sales and marketing – that’s what his happy clients tell him. Russell has built a reputation as a consummate professional, providing a steadfast commitment to his clients with attentive personal service, in-depth area knowledge and innovative marketing strategies. Russell’s successful track record is testament to his extensive knowledge of the Tamahere, Newstead and Matangi property market and his ability to develop targeted marketing strategies, including all forms of media: print, social media and digital. Russell is acutely aware of the localities' ever-changing growth trends and market diversity, as well as the latest unitary plans. Having experienced different property cycles during his time in the industry, Russell will negotiate the highest possible sales result for you, regardless of the market conditions, whether it be negotiated by auction, tender or private treaty. 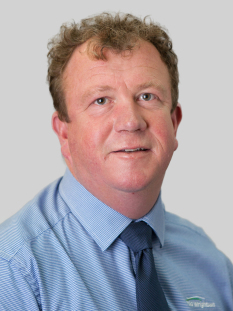 Russell's natural sales skills are complemented by his very infectious passion for selling property. He is driven, tenacious, experienced and absolutely committed to his clients. Energetic in all aspects of his life, Russell's enthusiasm and focus extends to the smallest detail. He is able to think quickly on his feet, is creative and has the uncanny ability to resuscitate many property transactions that would otherwise have fallen apart. Growing up in a small village in South Wales, Russell moved to New Zealand in 2012 with his wife, Angela, and two sons, Zak and James. Now living locally with an extensive network of friends around him, Russell embraces all the Waikato has to offer, which is evident in his work and his lifestyle. He balances his life by taking a daily early morning walk with the family dog, Doug, through the local reserves and river walkways. He also has a huge passion for the outdoors, with his favourite pastimes including rugby, cricket, running and spending time with his family. "Your home is often your largest financial asset and it's important to choose someone who understands the benefit of both home ownership and investment. Having made a career out of property, I offer you the highest level of service and the opportunity to achieve the best possible sales price. I am fascinated by property and I enjoy matching people with their ideal home. It's quite simply what I love to do."